This essay uses the concept of Christian nationalism to explore the religious dynamics of the Contra war and U.S.–Nicaraguan relations during Ronald Reagan’s presidency. Religious organizations and individuals played crucial roles on both sides in the war in Nicaragua and in the debates in the United States over support for the Contras. Evangelistic work strengthened transnational ties between Christians, but also raised the stakes of the war; supporters of the Sandinistas and Contras alike alleged a victory by their adversary imperiled the future of Christianity in Nicaragua. Christian nationalism thus manifested itself and intertwined in both the United States and Nicaragua. Examining how evangelicals and Catholics in the United States and Nicaragua, as well as the Reagan administration, the Contras, and the Sandinistas, used Christian nationalism to build support for their policy objectives sheds light on both the malleability and the power of identifying faith with the state. 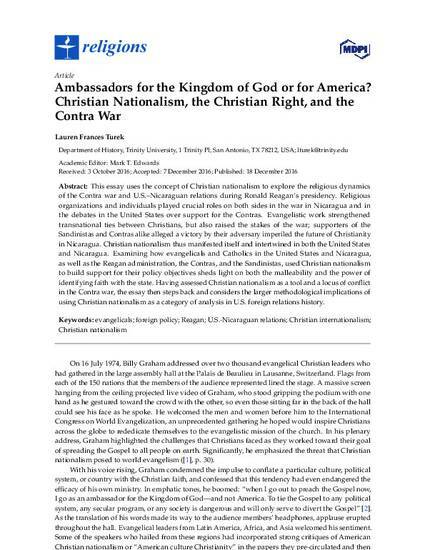 Having assessed Christian nationalism as a tool and a locus of conflict in the Contra war, the essay then steps back and considers the larger methodological implications of using Christian nationalism as a category of analysis in U.S. foreign relations history. Turek LF. Ambassadors for the Kingdom of God or for America? Christian Nationalism, the Christian Right, and the Contra War. Religions. 2016; 7(12):151.